The Achilles tendon is a terrible body part to injure, because it is engaged in the push-off phase of gait, which is itself crucial to common athletic activities like running and jumping. The Achilles heel consists of flexible connective tissues comprised of collagen that connect the heel with the calf muscle and twist together like a spring to help propel you forward. This tendon typically handles seven times your body weight—you can imagine the strain! When you combine that force with the natural weakening of the fibers that occurs with age, it’s easy to see how Achilles tendon injuries occur. Studies indicate that re-rupture rates range from 4.5 percent to as high as 27 percent in Achilles heel injuries. Here are five rehabilitative therapies our NYC podiatrists recommend to prevent this kind of future injury. Heavy load eccentric exercises involve wearing a weighted backpack (or, if you’re at the gym, a pulley system), standing on a stair (or riser), and performing heel raises. Using both legs, raise your heels as high as you can and gradually lower them back down through a full range of motion. 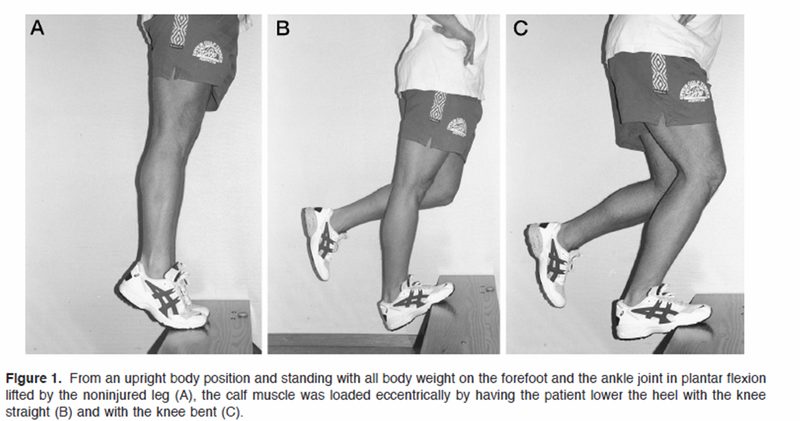 (Watch this video to see how to do eccentric exercises for tendinopathy.) Three sets of 15 repetitions are required every day for 12 weeks in order to see full benefits. This exercise is great for anyone–unless your pain is “disabling,” you are fit to train this way. Start by using your own body weight, and then progress to adding some light resistance; this is safe as long as your pain level stays below a 4/10. If you have had surgery to correct an Achilles tendon rupture, you should avoid calf exercises for at least six weeks. For an Achilles tendon injury without rupture, you want to wait until your cast or surgical boot comes off. From there, you can work with one of our sports medicine doctors to increase strength in your calf muscles safely and to take some of the pressure off your repairing Achilles tendon. New York Road Runners has a great video series on calf strengthening exercises that is similar to what we recommend–yet getting a personalized plan that works for your individual body is best. This very Latin-sounding muscle extends down the back of the leg to the tips of the toes and works with the Achilles to lift the heel during propulsion. Contracting this muscle as you run can really reduce the strain placed on the Achilles. A simple way to do this is to curl your toes downward during the push-off phase of running or walking. Try three sets of 40 reps each day. You can also work this muscle at home by performing some easy towel curls and marble pickups. Besides strengthening, an alternate method for improving Achilles function is deep-tissue massage. The underlying theory is that aggressive massage breaks down the weaker type III collagen fibers, and increases circulation in a way that encourages healing. To test this theory, researchers at the Biomechanics Lab at Ball State University surgically damaged the Achilles tendons in a group of rats. In one group, an aggressive deep-tissue massage was performed for three minutes on the 21st, 25th, 29th and 33rd day post-injury. Another group served as a control. One week later, both groups of rats had their tendons evaluated with electron microscopy. Not surprisingly, the tendons receiving deep tissue massage showed increased fibroblast proliferation, increased circulation, reduction of scar tissue, pain reduction and enhanced healing a week later. Scientists believe that the same healing mechanisms can achieve similar results in humans. The Center for Podiatric Care and Sports Medicine offers a more advanced method of breaking down scar tissue called extracorporeal shockwave therapy. By this method, machines emit high-frequency sonic vibrations at the site of injury. Researchers have achieved excellent results from this easy, non-invasive, painless treatment–especially among athletes with chronic Achilles tendon pain. If you’re in the area, visit The Center for Podiatric Care and Sports Medicine in New York City for all your Achilles tendon rehab needs. Our sports medicine doctors work with elaborate gait analysis equipment to train athletes how to run and move without causing further damage to aging, strained or ruptured tendons. This may involve slowing your pace by one minute per mile, shortening your stride length, switching to rear-foot strike, or choosing more flexible running shoes with duo-density midsoles and high toe springs. Come in to discover just what you need to keep your Achilles in prime condition.